Way back in 2014 I was introduced to Jaaxy Keyword Research Tool. At that time I was following a Super Affiliate who frequently talked about her favorite tool for keyword research. She didn’t name this tool, but as I used to find keyword research tiresome I ventured into her territory by clicking a link on her website. And there it was: Jaaxy, all bright and shiny. Now, you may have read warnings on my website about bright and shiny ‘temptations’. But, in the case of Jaaxy, the bright and shiny is absolutely lawful. If your keyword research experience is anything like mine was before I discovered Jaaxy, you may find the following review helpful. This Review tells how Jaaxy works and how it is able to help you to find quality keywords when writing content for use online. The use of keywords in website content has less importance placed on it than it did a while ago, maybe as far back as 2013. However, keywords are still a major factor when planning and writing content for use in a particular website. Building websites involve the creation of relevant content about a certain subject or niche. Using keywords or a keyword phrase helps to keep the content in line with the subject of a post, or the overall subject of the website. When you are searching on the internet for keywords suitable for your website pages and posts, you need to have a reliable tool that will give you the best results in keywords for the content that you are about to write. Jaaxy will provide these reliable keywords for you. the Average Number of Monthly exact match searches for that keyword. Please note: Search results shown are in accordance with date and time images were processed. Within Jaaxy there is a selection of attributes to assist in identifying the best keywords for content creation. Rather than list each one in this review, I’ve chosen to highlight below, two of my favorites. They are Alphabet Soup and Site Rank. A strange name but fantastic feature I choose to use for selection of the best keyword for a new post. This feature is a fast and efficient for finding a wide selection of keywords within a chosen niche. This is a super attribute for speedily identifying search engine ranking of individual posts. The image below reveals my post ‘How to Create a Call To Action That is Effective’ is ranking in No. 1 position in both Bing and Yahoo search engines. It also reveals that the post is not ranking in Google. Therefore, work is required on my part to achieve a Page 1 ranking of this post in Google. Nowhere else on the internet have I found a tool that provides this valuable information in a matter of seconds. With regular daily or weekly publishing to a website, the Jaaxy Site Rank feature is a valuable time saver that provides accurate information. What Does It Cost to Use Jaaxy? 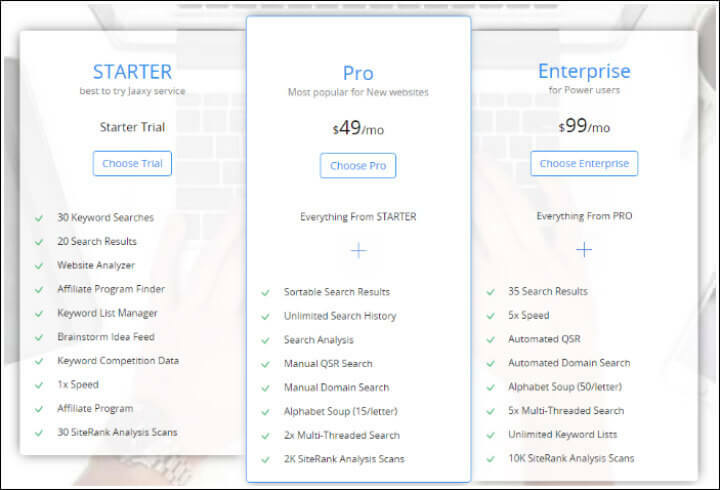 Starter Trial: This is a Free subscription for up to 30 Keyword Searches. Pro Version: Is $49 per month and absolutely adequate for providing valuable keywords for your content. Enterprise: A sophisticated version at $99 per month, and a delight to use. However, it is not necessary to the success of my keyword research. Pro version provides all I require. Jaaxy affiliate program is available to all subscribers. Personally, I have not experienced disadvantages with using Jaaxy. However, a paid subscription is required to gain access on completion of 30 Free Searches offered in the Starter Trial version of this program. The Jaaxy keyword research tool is absolutely legitimate. I believe that I receive from Jaaxy the best keyword research results available on the internet. I have no interest in learning of, or using any other keyword research tool. Jaaxy is a quality tool available at an affordable price. Jaaxy gives the most reliable results against any other keyword research tool I have ever used. I do not see the subscription as off-putting. It is a matter of weighing up the benefit of subscribing to an super efficient keyword tool, as opposed to struggling with tools that do not provide quality results. 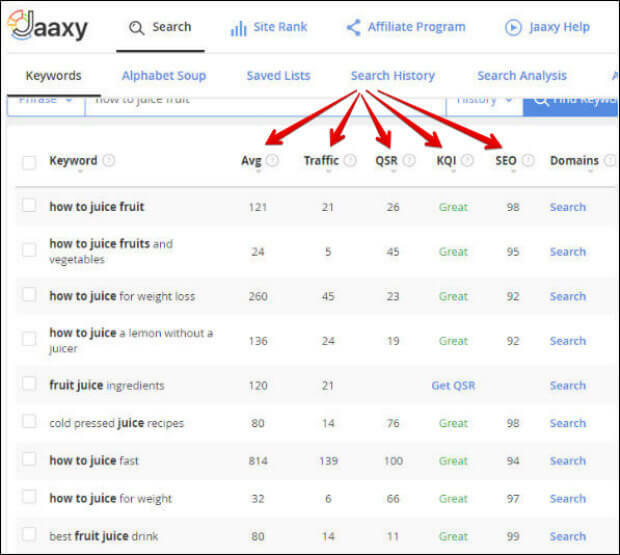 I have used Jaaxy keyword research tool for greater than 4 years, and I would not want to be without it. Prior to my knowledge of Jaaxy I used several keyword research tools, some included a fee while others were free of charge, but not one of them performed the job that Jaaxy does. I highly recommend that anyone who is serious about obtaining quality keyword results for their website takes advantage of the Starter Trial version. I am sure you will enjoy the experience as well as having nothing to lose and much to gain. Should you decide to take a paid subscription, please be aware that your subscription can easily be cancelled at the end of that month. A one-month paid subscription is adequate time to experience the benefit of this great keyword research tool. Thank you for visiting this website and reading my Review of the Jaaxy Keyword Research Tool. Your comments and questions are welcome, below. Hi Jacob, Thank you for you for visiting my Jaaxy review. It is a good reminder that an update is well overdue not only in text, but with images too. I joined Jaaxy long before I found WA, so I can’t speak now as to whether or not the free month was in place then. However, I thank you pointing this out and I will update the review. I am very pleased to be of help. Keywords are still extremely important today. Jaaxy provides all the important information that you need to have a successful website and business today. In order to rank for your keywords and get on page one of Google, you need the results that Jaaxy offers. The keyword quality indicator is crucial in determining what keywords you choose. You get 30 free keyword searches and then it’s only $19 a month and well worth it! Thanks for the information! Jaaxy certainly is an incredible keyword research tool and I find it of tremendous value to my business. I recommend Jaaxy to anyone who is serious about developing and growing an online business. In order to be successful online you need top notch keywords. I’ve used keyword tools in the past that were good but nothing compared to Jaaxy. Jaaxy is easy to use and offers the ranking of the keywords. It tells you what the competition is and what your ranking will be for each particular keyword. You get 30 free searches and then the cost is $19 a month. It’s a small price to pay for endless supplies of keywords that will help build your online business. Thank you for visiting my review of Jaaxy and leaving your comment. I’m pleased to know you enjoy using the Jaaxy Keyword Research Tool. You are certainly right when you say this tool is easy to use. I have tried many keyword research tools but have never found anything to equal Jaaxy’s performance. I also agree that after the 30 free searches, the monthly cost of $19 is a small price to pay for the value received. With most SEO tools and keyword options I use I find that the results are not quite there – I’m always off in the success of the eventual choice…leading to really poor traffic. I suppose that’s where the competition parameter of jaaxy comes into play right? It can give you a more detailed view of what traffic is to come? I understand what you are saying Chris about most keyword tools. My results were similar to yours in those days before I discovered the Jaaxy Keyword tool. Your comment about Jaaxy’s competition parameter is correct. I find it extremely valuable. Also, the KQI, being the red, yellow or green indicators, are to be taken seriously. My recommendation is to choose keywords with a green indicator. I feel it is safer not to choose keywords with a yellow or red indicator. Stay with green indicators and the results will happen! Thanks Chris for leaving your comment. Jaaxy tool is so great, it is amazing how a tool can be on point. Jaaxy is truly a blessing to Affiliate marketers and this tool makes life so easy. All it takes is knowing how to use it and the rest is history. Thanks for sharing how this wonderful tool works, all the best to you and have a good day. Thanks Norman for your comment. I agree that Jaaxy is a true blessing for those who are Affiliate Marketers. Jaaxy is such a great tool. I was on the pro membership for a month and I could see the value it would bring to a site I am working on. I plan on going to the enterprise membership once my site picks up. The things I probably like the most about Jaaxy is the site ranking. its always cool to see that your site is being ranked in google. thanks! Thanks for your comment Ralph. I agree that Jaaxy is of great value to everyone who is seeking traffic organically. It is also extremely helpful with finding ideas for posts. And, as you say, Jaaxy is great for checking site ranking. It is the best tool I have used for finding exactly where my posts are ranking in Google. Having sampled a variety of keyword tools, I would say the majority have disappointed me because I couldn’t make sense of the metrics and weren’t very easy to use from a beginners perspective. Jaaxy, on the other hand, sure looks like a more effective keyword tool that’s also simple to understand. Jaaxy really has many benefits, so I’m definitely looking into the month’s free subscription. Hi Neil – Thanks so much for your comment. I certainly recommend trialing Jaaxy’s free month’s subscription. I’m sure you will be delighted with the results from keywords you find in Jaaxy. To my way of thinking Jaaxy rates far above other keyword research tools. And then there are the additional features Jaaxy provides that make this tool a pleasure to use. All the best to you Neil with your month’s free subscription. Your review about Jaaxy is informative and clear; it has tools to search for the keywords for your content. The good thing about Jaaxy is that you can pay for the month you need to look for keywords. It has a real impact on you ranking also. Many thanks for your comment about my Jaaxy review. Thanks also for pointing out the fact that Jaaxy can be subscribed to for just the month that you need to look for keywords. That is helpful information. And, I believe that it is easy to re-subscribe for another month at any time you need to do more keyword research. I use jaaxy for my keywords and i must say that it is the best so far that i have come across. Did you know that everytime i use jaaxy for my keywords i get ranked in 30 minutes? I know there are other people who get ranked in a short while than me but how many people don’t get ranked even after 7 days? i know that jaaxy is the best and anybody who have not tried it should try it. Thanks so much Barrack for leaving a comment. It is great to read about your quick ranking when using Jaaxy. I had not thought about checking my ranking out after using Jaaxy, and I will do so next time I post an article. Your positive comments about Jaaxy are pleasing to read and I agree that everybody should try it. Thanks again Barrack, and best wishes. I used the Jaaxy application a few months ago and just from the thirty free searches I developed a huge keyword list for my blog. I may not need the program all the time but I will definitely pay for a month here and there when the need arises. Excellent program. Thanks so much Ket for leaving a comment. It is great to know that you got so much benefit from Jaaxys free searches. I am similar to you with using Jaaxy, if I want to take break I do and the great thing is that all my saved lists are there when I re-subscribed. How good is that! As you said Ket, Jaaxy is an excellent program. First, let me just tell you that you have a very nice review here. I’m always happy when I am looking for information on something and it is laid out as well as your review here. I am going to go and set up my free trial now! I think that this is going to work quite well for me and I imagine that I’ll be burning through my 30 free searches pretty quick! Overall it looks to be an excellent resource and I am hoping that it will help drive outrageous amounts of traffic to my site! Many thanks Zach for visiting my site and leaving such a pleasing comment. It is very encouraging to read about people enjoying the experience of a review or article. I’m pleased to learn that you are going to set up your free trial of Jaaxy. No doubt you will be running through your 30 searches rather quickly, but the experience will be rewarding, I am sure. I am rather addicted to Jaaxy which sounds peculiar but I am sure you will eventually feel similar. Thanks again, and best wishes to you. Great review, I also used Jaaxy for a while. Just as you pointed out, it’s only free for the first month and for new business owner, I think it’s a little bit pricey. I mean it can limit may be only 30 searches/month for free users, or something like that until people feel really comfortable with it or begin to make some money to invest in the “paid” version. But if you have some money, I think the investment is totally worthwhile. Thanks so much for your comments on my review of Jaaxy. I am pleased that you enjoyed it. I agree with you about the cost after the first month. It is no good spending money on tools unless you have a budget to meet the payments, otherwise it makes building a website stressful and that is not what it should be about.